Have you been feeling a little weary lately? Have you felt drained, discouraged, alone or even stressed out? Maybe you feel that business has become soooo slow, so boring and so unfulfilling (compared to what you have experienced in the past). If you really want to create a BUZZ for your business but you don't know how to get the spark back then I encourage you to open up yourself to some of the reasons why things aren't work! You just don't feel as motivated as you used to feel back in the day! You feel so bored of the same old, you feel as if you just dilly dallying which isn't fun. One of the best ways to get your passion back is to do more of what you LOVE! Your passion won't be sparked in your business if you never do the fun and exciting things that make you feel so good. You have done everything to grow your business EXCEPT for take PR and Media seriously. It has always been something that you will do ONE DAY. Do you realise that this might be the missing link? By shying away from TV shows, Radio shows, Magazine features, Press etc you end up leaving thousands and thousands of pounds on the table along with leaving hundreds of amazing media opportunities on the table (and then you wonder why something seems to be hugely missing in your business). Now is the the time to start being in the Media my friend, no more hiding away from PR as this could really boost your sales and raise your profile in a way that is beyond what you could achieve with only online marketing. This could be podcasts, videos, blog posts, live streams etc. You need to create enough good and GREAT content that people can literally just binge watch on your content, this will increase your chances of making money and also make you stand out as an expert in your field. Daniel Priestly author of the book 'Over Subscribed' mentioned the importance of creating over 7hrs of content. He explained that some companies spend 7 hours with potential clients to close BIG deals. Now you know why some luxury brands invite you in for an appointment with Champagne. Now you might say I have lots of videos on YouTube. Or you might say 'I have lots of FB lives' but maybe you are called to go even higher which could mean interviewing a powerful influencer once a week, creating a daily show, creating a weekly show or launching a podcast. Consider adding in new and fresh ideas into your Social Media strategy. You are not working on your mind-set work! This includes journalling, letting go of wrong mindsets, forgiveness work and so much more! I encourage you to journal daily and write down your vision! There is a saying that goes like this "Millionaires write down their goals once a day, billionaires write down their goals twice a day". Get writing, keep doing the inner work. There a big percentage of people that will never buy from you or work with you until you get your media page up. Your publicity page establishes you as an expert, it makes you stand out in a room full of sammies. When you have a media page full of your amazing features i.e. Links to podcasts, magazines you've been featured in etc you indirectly prove to potential clients and the media that your brand has creditably. They think well if she's been in Elle Magazine and if she's been featured in 'The Huffington Post' surely she's doing something powerful in society then they jump at a chance to work with you. Blogging is a powerful marketing strategy that can help you pull in ideal clients and make you stand out as the expert. One of the reason why highly successful multiple 6, 7, or 8 figure Influencers such as Alex Beadon, Marie Forleo, Brendon Burchard, Kate Northrup and Jessica Nazarali have such a huge following online with hundreds of thousands of fans or millions of videos views online is because they blog consistently! Your blog is a way to pull in clients, increase your chances of being featured in the media and it can also prepare you to write your first or your next book. So I definitely encourage you to commit to blogging on a weekly, bi-weekly basis or blog at least once a month. Kat Loterzo (Katrina Ruth) blogs every day and she makes an average of 300,000 a month in her business along with being a multiple best selling author with 57 books on amazon. 9) You refuse to hire a Coach (perhaps you need to even hire 3 coaches at this stage but you stubbornly refuse to invest in yourself and you wonder why you as always struggling. You are so afraid of pitching and coming cross as too salesy (and your bank account reflects this). Now I know that you might find it really CRINGING to reach out to people but sometimes you need to, if your dream clients aren't coming to you, I honestly believe that there is no harm in reaching out to people and sending proposals to work with people that seem like your ideal clients. If you do this in a genuine, elegant and loving way then will be excited to receive your proposal. If you need help with this I encourage you to book a discovery call with me here and let me give you some tips on how to do this without coming across as pushy. One of the ways to do this is to create systems and structures, sample letters and processes. I will give you an example, I have noticed that my clients always want to know how to pitch to the Media and so I have created a sample pitch PDF where they can just learn exactly the process of pitching to the media and following up with the media. Perhaps your branding message, brand vision and your brand story is a bit off, perhaps it's time for a upgrade. One of the ways that I upgraded in my business is to hire a VA to do my graphics for me so that they look more glamorous and fabulous. I feel the difference when I post my glossy graphics on Instagram compared to when I do it myself. It's definitely worth investing in your branding in a bigger way! This could even mean doing something such as hiring a videographer to help you make better videos. Let me know what you think of this latest blog post? Which 2-3 points really reasonated with you the most? The doors to my new course is open Whoo hoo: It is called "Social Media, Publicity and Money"
I am searching for 15-20 AMAZING, SUCCESS DRIVEN, PASSIONATE, DETERMINED TO BREAK INTO THE MEDIA (AND GO BIG ON SOCIAL MEDIA) ladies and gents to join me for this 6 part audio course which is also a 30 day BOOT CAMP with a private FB group for all members. I'll be live streaming in this group consistently and sharing my BEST PR and Media secrets. 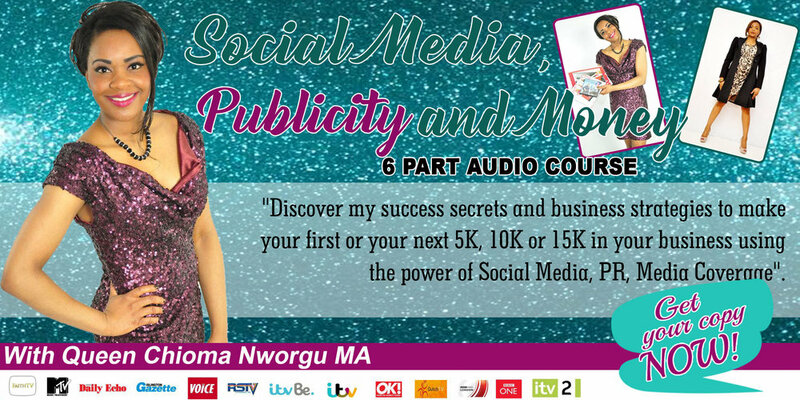 This course will teach you how to use Social Media and Publicity to increase you sales, attract clients and it will help you to become a money magnet. This course is also packed with some amazing bonuses i.e. If you are one of the first 5 people to sign up you will receive a FREE 30 mins "Social Media, Publicity and Money Coaching Session" (there are only 4 spots left for this session so hurry). Click on the image below and join me for this EXCITING COURSE. Your time to become more confident and charismatic onlone is NOW!